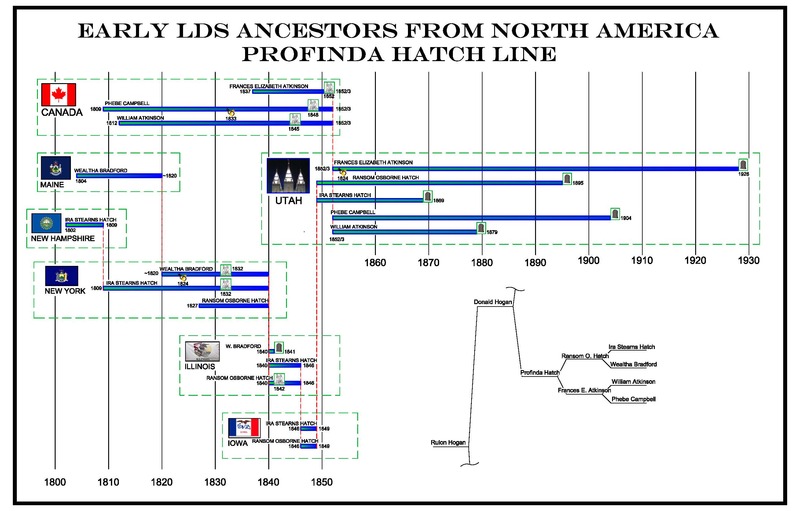 This timeline shows the important dates and places of our earliest LDS convert ancestors, who originated in North America - Profinda Hatch Line. Phoebe ATKINSON Self W Female W 71 N.B. Keeping House N.B. N.B. Rhoda ATKINSON Dau S Female W 24 UT At Home N.B. N.B. [S20] FamilySearch (TM) International Genealogical Index v5.0, Intellectual Reserve, Inc., (The Church of Jesus Christ of Latter-Day Saints http://www.familysearch.org), Death Certificate (Reliability: 3). [S3] FamilySearch Extraction Program, The Church of Jesus Christ of Latter-day Saints, ((http://new.familysearch.org)), accessed 19 Oct 2016), entry for Phebe Campbell, person ID KWJP-CBC. (Reliability: 3).